Yesterday, on the sunny Saturday of April 25, we attended improvised Spanish Spring Festival in the independent theatre "Skatuve" (www.skatuve.lv). Here's a little insight into this event. "Feria de Abril" - Spring Festival that is annually celebrated in a southern province of Spain - Andalucia. This festival is especially popular in Seville, where flamenco parties last for days and everyone`s dancing sevilliana. Also the traditional bull fights and horse-trading takes place there. Spanish culture in its most popular forms - hot-blooded music, flamenco dancing, sincere discussions. 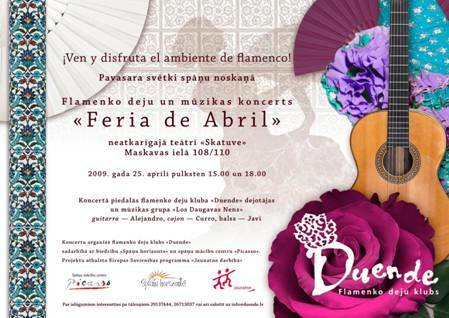 At the beginning of the concert it seemed that the dancers cannot drop the Latvian self-conscious, sincere and gentle movements, but, encouraged by the Spanish music and the applause of the audience, they revealed the true flamenco temperament in the course of the event. It is not that easy to perform the complex taps, maintaining a straight back and a head held high. They don`t have the Spanish and Gypsy mentality in their blood, thus they lack rapid and self-confident moves. (I can say so because being in Spain I saw the Spanish performance of flamenco ). But the girls did a great job! How much effort and training were needed for preparing the performance was demonstrated by a short class which was offered to the most courageous part of the audience, who climbed on stage to try out flamenco steps. A real Spanish mood was created by the performance of Latvian speaking Spanish musicians - singer javi, guitarist Alejandro and cajon player Curro. The 2nd Exotic Dance Festival "Magic Carpet"
Exotic Dance Festival "Magic Carpet"
The 3rd Exotic Dance Festival "Magic Carpet"
The april feria is all the years in Riga, i mean in the same place?